Last friday (july 17th 2009), somebody (nick)named ‘Crazy_Hacker’ has reported a vulnerability in Easy RM to MP3 Conversion Utility (on XP SP2 En), via packetstormsecurity.org. (see http://packetstormsecurity.org/0907-exploits/). The vulnerability report included a proof of concept exploit (which, by the way, failed to work on my MS Virtual PC based XP SP3 En). Another exploit was released just a little bit later. Nice work. You can copy the PoC exploit code, run it, see that it doesn’t work (or if you are lucky, conclude that it works), or… you can try to understand the process of building the exploit so you can correct broken exploits, or just build your own exploits from scratch. (By the way : unless you can disassemble, read and comprehend shellcode real fast, I would never advise you to just take an exploit (especially if it’s a precompiled executable) and run it. What if it’s just built to open a backdoor on your own computer ? The question is : How do exploit writers build their exploits ? What does the process of going from detecting a possible issue to building an actual working exploit look like ? How can you use vulnerability information to build your own exploit ? Ever since I’ve started this blog, writing a basic tutorial about writing buffer overflows has been on my “to do” list… but I never really took the time to do so (or simply forgot about it). When I saw the vulnerability report today, and had a look at the exploit, I figured this vulnerability report could acts as a perfect example to explain the basics about writing exploits… It’s clean, simple and allows me to demonstrate some of the techniques that are used to write working and stable stack based buffer overflows. Before we continue, let me get one thing straight. This document is purely intended for educational purposes. I do not want anyone to use this information (or any information on this blog) to actually hack into computers or do other illegal things. So I cannot be held responsible for the acts of other people who took parts of this document and used it for illegal purposes. If you don’t agree, then you are not allowed to continue to access this website… so leave this website immediately. First of all, let’s verify that the application does indeed crash when opening a malformatted m3u file. (or find yourself an application that crashes when you feed specifically crafted data to it). Get yourself a copy of the vulnerable version of Easy RM to MP3 and install it on a computer running Windows XP. The vulnerability report states that the exploit works on XP SP2 (English), but I’ll use XP SP3 (English). Run the perl script to create the m3u file. The fill will be filled with 10000 A’s (\x41 is the hexadecimal representation of A) and open this m3u file with Easy RM to MP3…. The application throws an error, but it looks like the error is handled correctly and the application does not crash. Modify the script to write a file with 20000 A’s and try again. Same behaviour. (exception is handled correctly, so we still could not overwrite anything usefull). Now change the script to write 30000 A’s, create the m3u file and open it in the utility. Ok, so the application crashes if we feed it a file that contains between 20000 and 30000 A’s. But what can we do with this ? Obviously, not every application crash can lead to an exploitation. In many cases, an application crash will not lead to exploitation… But sometimes it does. With “exploitation”, I mean that you want the application to do something it was not intended to do… such as running your own code. The easiest way to make an application do something different is by controlling its application flow (and redirect it to somewhere else). This can be done by controlling the Instruction Pointer (or Program Counter), which is a CPU register that contains a pointer to where the next instruction that needs to be executed is located. stack segment (used to pass data/arguments to functions, and is used as space for variables. The stack starts (= the bottom of the stack) from the very end of the virtual memory of a page and grows down (to a lower address). a PUSH adds something to the top of the stack, POP will remove one item (4 bytes) from the stack and puts it in a register. If you want to access the stack memory directly, you can use ESP (Stack Pointer), which points at the top (so the lowest memory address) of the stack. After a POP, ESP points to a higher address (address is incremented (by 4 bytes in case of addresses/pointers)). Increments happen after an item is removed from the stack. When a function/subroutine is entered, a stack frame is created. This frame keeps the parameters of the parent procedure together and is used to pass arguments to the subrouting. The current location of the stack can be accessed via the stack pointer (ESP), the current base of the function is contained in the base pointer (EBP) (or frame pointer). EBX : base (does not have anything to do with base pointer). It has no general purpose and can be used to store data. ECX : counter : used for iterations. ECX counts downward. EDX : data : this is an extension of the EAX register. It allows for more complex calculations (multiply, divide) by allowing extra data to be stored to facilitate those calculations. When an application is stared in a Win32 environment, a process is created and virtual memory is assigned to. In a 32 bit process, the address ranges from 0x00000000 to 0xFFFFFFFF, where 0x00000000 to 0x7FFFFFFF is assigned to "user-land", and 0x80000000 to 0xFFFFFFFF is assigned to "kernel land". Windows uses the flat memory model, which means that the CPU can directly/sequentially/linearly address all of the available memory locations, without having to use a segmentation/paging scheme. Kernel land memory is only accessible by the OS. When a process is created, a PEB (Process Execution Block) and TEB (Thread Environment Block) are created. Each thread inside the process has one TEB. The text segment of a program image / dll is readonly, as it only contains the application code. This prevents people from modifying the application code. This memory segment has a fixed size. The data segment is used to store global and static program variables. The data segment is used for initialized global variables, strings, and other constants. The data segment is writable and has a fixed size. The heap segment is used for the rest of the program variables. It can grow larger or smaller as desired. All of the memory in the heap is managed by allocator (and deallocator) algorithms. A memory region is reserved by these algo’s. The heap will grow towards a higher addresses. In a dll, the code, imports (list of functions used by the dll, from another dll or application), and exports (functions it makes available to other dll’s applications) are part of the .text segment. 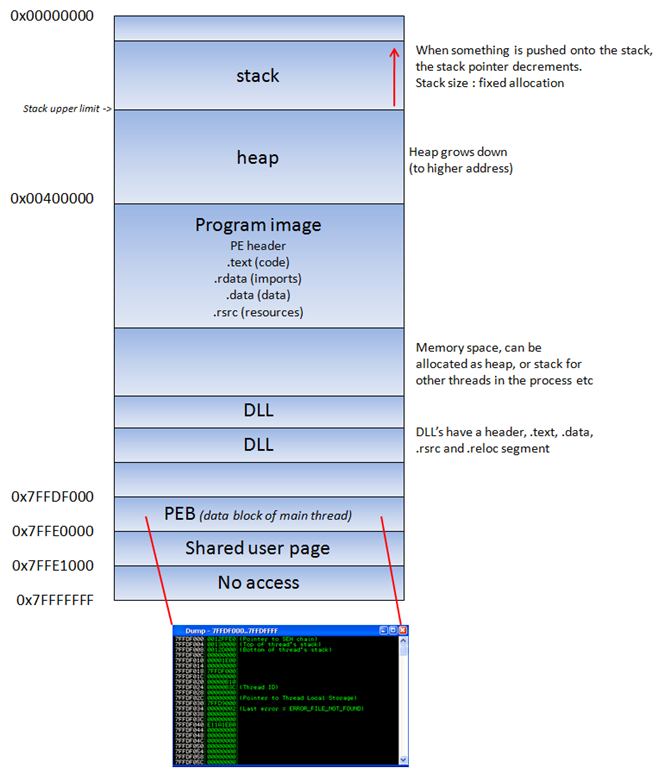 The stack is a piece of the process memory, a data structure that works LIFO (Last in first out). A stack gets allocated by the OS, for each thread (when the thread is created). When the thread ends, the stack is cleared as well. The size of the stack is defined when it gets created and doesn’t change. Combined with LIFO and the fact that it does not require complex management structures/mechanisms to get managed, the stack is pretty fast, but limited in size. LIFO means that the most recent placed data (result of a PUSH instruction) is the first one that will be removed from the stack again. (by a POP instruction). When a stack is created, the stack pointer points to the top of the stack ( = the highest address on the stack). As information is pushed onto the stack, this stack pointer decrements (goes to a lower address). So in essence, the stack grows to a lower address. The stack contains local variables, function calls and other info that does not need to be stored for a larger amount of time. As more data is added to the stack (pushed onto the stack), the stack pointer is decremented and points at a lower address value. Every time a function is called, the function parameters are pushed onto the stack, as well as the saved values of registers (EBP, EIP). When a function returns, the saved value of EIP is retrieved from the stack and placed back in EIP, so the normal application flow can be resumed. (You can compile this code. Get yourself a copy of Dev-C++ 4.9.9.2, create a new Win32 console project (use C as language, not C++), paste the code and compile it). On my system, I called the project "stacktest". Run the application : "stacktest.exe AAAA". Nothing should return. This applications takes an argument (argv and passes the argument to function do_something(). In that function, the argument is copied into a local variable that has a maximum of 128 bytes. So… if the argument is longer than 127 bytes (+ a null byte to terminate the string), the buffer may get overflown. A new stack frame will be created, on top of the ‘parent’ stack. The stack pointer (ESP) points to the highest address of the newly created stack. This is the "top of the stack". Before do_something() is called, a pointer to the argument(s) gets pushed to the stack. In our case, this is a pointer to argv. Next, function do_something is called. The CALL instruction will first put the current instruction pointer onto the stack (so it knows where to return to if the function ends) and will then jump to the function code. As a result of the push, ESP decrements 4 bytes and now points to a lower address. ESP points at 0022FF5C. At this address, we see the saved EIP (Return to…), followed by a pointer to the parameter (AAAA in this example). This pointer was saved on the stack before the CALL instruction was executed. Next, the function prolog executes. This basically saves the frame pointer (EBP) onto the stack, so it can be restored as well when the function returns. The instruction to save the frame pointer is "push ebp". ESP is decremented again with 4 bytes. Following the push ebp, the current stack pointer (ESP) is put in EBP. At that point, both ESP and EBP point at the top of the current stack. From that point on, the stack will usually be referenced by ESP (top of the stack at any time) and EBP (the base pointer of the current stack). This way, the application can reference variables by using an offset to EBP. So, if you would push 4 bytes to the stack, ESP would decrement with 4 bytes and EBP would still stay where it was. You can then reference these 4 bytes using EBP-0x4. Next, we can see how stack space for the variable MyVar (128bytes) is declared/allocated. In order to hold the data, some space is allocated on the stack to hold data in this variable… ESP is decremented by a number of bytes. This number of bytes wil most likely be more than 128 bytes, because of an allocation routine determined by the compiler. In the case of Dev-C++, this is 0x98 bytes. So you will see a SUB ESP,0x98 instruction. That way, there will be space available for this variable. (don’t worry about the code too much. You can clearly see the function prolog (PUSH EBP and MOV EBP,ESP), you can also see where space gets allocated for MyVar (SUB ESP,98), and you can see some MOV and LEA instructions (which basically set up the parameters for the strcpy function… taking the pointer where argv sits and using it to copy data from, into MyVar. If there would not have been a strcpy() in this function, the function would now end and "unwind" the stack. Basically, it would just move ESP back to the location where saved EIP was, and then issues a RET instruction. A ret, in this case, will pick up the saved EIP pointer from the stack and jump to it. (thus, it will go back to the main function, right after where do_something() was called). The epilog instruction is executed by a LEAVE instruction (which will restore both the framepointer and EIP). In my example, we have a strcpy() function. This function will read data, from the address pointed to by [Buffer], and store it in , reading all data until it sees a null byte (string terminator). While it copies the data, ESP stays where it is. The strcpy() does not use PUSH instructions to put data on the stack… it basically reads a byte and writes it to the stack, using an index (for example ESP, ESP+1, ESP+2, etc). So after the copy, ESP still points at the begin of the string. ESP still points at the begin of the string. The strcpy() completes as if nothing is wrong. After the strcpy(), the function ends. And this is where things get interesting. The function epilog kicks in. Basically, it will move ESP back to the location where saved EIP was stored, and it will issue a RET. It will take the pointer (AAAA or 0x41414141 in our case, since it got overwritten), and will jump to that address. Long story short, by controlling EIP, you basically change the return address that the function will uses in order to “resume normal flow”. Of course, if you change this return address by issuing a buffer overflow, it’s not a “normal flow” anymore. So… Suppose you can overwrite the buffer in MyVar, EBP, EIP and you have A’s (your own code) in the area before and after saved EIP… think about it. After sending the buffer ([MyVar][EBP][EIP][your code]), ESP will/should point at the beginning of [your code]. So if you can make EIP go to your code, you’re in control. Note : when a buffer on the stack overflows, the term "stack based overflow" or "stack buffer overflow" is used. When you are trying to write past the end of the stack frame, the term "stack overflow" is used. Don’t mix those two up, as they are entirely different. In order to see the state of the stack (and value of registers such as the instruction pointer, stack pointer etc), we need to hook up a debugger to the application, so we can see what happens at the time the application runs (and especially when it dies). Let’s use Windbg. Install Windbg (Full install) and register it as a “post-mortem” debugger using “windbg -I”. If you want to use Immunity Debugger instead : get a copy here and install it. Open Immunity debugger, go to "Options" – "Just in-time debugging" and click "Make Immunity Debugger just in-time debugger". This GUI shows the same information, but in a more…errr.. graphical way. In the upper left corner, you have the CPU view, which shows assembly instructions and their opcodes. (the window is empty because EIP currently points at 41414141 and that’s not a valid address). In the upper right windows, you can see the registers. In the lower left corner, you see the memory dump of 00446000 in this case. In the lower right corner, you can see the contents of the stack (so the contents of memory at the location where ESP points at). Anyways, in both cases, we can see that the instruction pointer contains 41414141, which is the hexidecimal representation for AAAA. So it looks like part of our m3u file was read into the buffer and caused the buffer to overflow. We have been able to overflow the buffer and write across the instruction pointer. So we may be able to control the value of EIP. Since our file does only contain A’s, we don’t know exactly how big our buffer needs to be in order to write exactly into EIP. In other words, if we want to be specific in overwriting EIP (so we can feed it usable data and make it jump to our evil code, we need to know the exact position in our buffer/payload where we overwrite the return address (which will become EIP when the function returns). This position is often referred to as the “offset”. We know that EIP is located somewhere between 20000 and 30000 bytes from the beginning of the buffer. Now, you could potentially overwrite all memory space between 20000 and 30000 bytes with the address you want to overwrite EIP with. This may work, but it looks much more nice if you can find the exact location to perform the overwrite. In order to determine the exact offset of EIP in our buffer, we need to do some additional work. Let’s cut things in half. We’ll create a file that contains 25000 A’s and another 5000 B’s. If EIP contains an 41414141 (AAAA), EIP sits between 20000 and 25000, and if EIP contains 42424242 (BBBB), EIP sits between 25000 and 30000. Create the file and open crash25000.m3u in Easy RM to MP3. That is great news. We have overwritten EIP with BBBB and we can also see our buffer in ESP. Before we can start tweaking the script, we need to find the exact location in our buffer that overwrites EIP. In order to find the exact location, we’ll use Metasploit. Metasploit has a nice tool to assist us with calculating the offset. It will generate a string that contains unique patterns. Using this pattern (and the value of EIP after using the pattern in our malicious .m3u file), we can see how big the buffer should be to write exactly into EIP. Edit the perl script and replace the content of $junk2 with our 5000 characters. 1094. That’s the buffer length needed to overwrite EIP. So if you create a file with 25000+1094 A’s, and then add 4 B’s (42 42 42 42 in hex) EIP should contain 42 42 42 42. We also know that ESP points at data from our buffer, so we’ll add some C’s after overwriting EIP. Let’s try. Modify the perl script to create the new m3u file. In Immunity Debugger, you can see the contents of the stack, at ESP, by looking at the lower right hand window. Note : the offset shown here is the result of the analysis on my own system. If you are trying to reproduce the exercises from this tutorial on your own system, odds are high that you will get a different offset address. So please don’t just take the offset value or copy the source code to your system, as the offset is based on the file path where the m3u file is stored. The buffer that is vulnerable to an overflow includes the full path to the m3u file. So if the path on your system is shorter or larger than mine, then the offset will be different. 26090 bytes 4 bytes 4 bytes 1000 bytes ? We control EIP. So we can point EIP to somewhere else, to a place that contains our own code (shellcode). But where is this space, how can we put our shellcode in that location and how can we make EIP jump to that location ? In order to crash the application, we have written 26094 A’s into memory, we have written a new value into the saved EIP field (ret), and we have written a bunch of C’s. When the application crashes, take a look at the registers and dump all of them (d esp, d eax, d ebx, d ebp, …). If you can see your buffer (either the A’s or the C’s) in one of the registers, then you may be able to replace those with shellcode and jump to that location. In our example, We can see that ESP seems to point to our C’s (remember the output of d esp above), so ideally we would put our shellcode instead of the C’s and we tell EIP to go to the ESP address. Despite the fact that we can see the C’s, we don’t know for sure that the first C (at address 000ff730, where ESP points at), is in fact the first C that we have put in our buffer. my $shellcode = "1ABCDEFGHIJK2ABCDEFGHIJK3ABCDEFGHIJK4ABCDEFGHIJK" . tell EIP to jump to the address of the start of the shellcode. We can do this by overwriting EIP with 0x000ff730. We’ll build a small test case : first 26094 A’s, then overwrite EIP with 000ff730, then put 25 NOP’s, then a break, and then more NOP’s. If all goes well, EIP should jump 000ff730, which contains NOPs. The code should slide until the break. The application died, but we expected a break instead of an access violation. When we look at EIP, it points to 000ff730, and so does ESP. When we dump ESP, we don’t see what we had expected. 000ff730 0000            add     byte ptr [eax],al          ds:0023:00000001=?? Long story short : we cannot just overwrite EIP with a direct memory address such as 000ff730. It’s not a good idea because it would not be reliable, and it’s not a good idea because it contains a null byte. We have to use another technique to achieve the same goal : make the application jump to our own provided code. Ideally, we should be able to reference a register (or an offset to a register), ESP in our case, and find a function that will jump to that register. Then we will try to overwrite EIP with the address of that function and it should be time for pancakes and icecream. We have managed to put our shellcode exactly where ESP points at (or, if you look at it from a different angle, ESP points directly at the beginning of our shellcode). If that would not have been the case, we would have looked to the contents of other register addresses and hope to find our buffer back. Anyways, in this particular example, we can use ESP. The reasoning behind overwriting EIP with the address of ESP was that we want the application to jump to ESP and run the shellcode. Jumping to ESP is a very common thing in windows applications. In fact, Windows applications use one or more dll’s, and these dll’s contains lots of code instructions. Furthermore, the addresses used by these dll’s are pretty static. So if we could find a dll that contains the instruction to jump to esp, and if we could overwrite EIP with the address of that instruction in that dll, then it should work, right ? Let’s see. First of all, we need to figure out what the opcode for “jmp esp” is. Upon attaching the debugger to the process, the application will break. Now we need to find this opcode in one of the loaded dll’s. If we can find the opcode in one of these dll’s, then we have a good chance of making the exploit work reliably across windows platforms. If we need to use a dll that belongs to the OS, then we might find that the exploit does not work for other versions of the OS. So let’s search the area of one of the Easy RM to MP3 dll’s first. 01d3b22a  ff e4 07 07 f2 01 57 f2-5d 1c d3 e8 09 22 d5 d0  ......W.]...."..
01d503d9  ff e4 17 b7 e3 77 31 bc-b4 e7 68 89 bb 99 54 9d  .....w1...h...T.
01d5736d  ff e4 17 b7 e3 77 31 bc-b4 e7 68 89 bb 99 54 9d  .....w1...h...T.
01d60159  ff e4 17 b7 e3 77 31 bc-b4 e7 68 89 bb 99 54 9d  .....w1...h...T.
Excellent. (I did not expect otherwise… jmp esp is a pretty common instruction). When selecting an address, it is important to look for null bytes. You should try to avoid using addresses with null bytes (especially if you need to use the buffer data that comes after the EIP overwrite. The null byte would become a string terminator and the rest of the buffer data will become unusable). pvefindaddr, a plugin for Immunity Debugger. In fact, this one is highly recommended because it will automatically filter unreliable pointers. Since we want to put our shellcode in ESP (which is placed in our payload string after overwriting EIP), the jmp esp address from the list must not have null bytes. If this address would have null bytes, we would overwrite EIP with an address that contains null bytes. Null byte acts as a string terminator, so everything that follows would be ignored. In some cases, it would be ok to have an address that starts with a null byte. If the address starts with a null byte, because of little endian, the null byte would be the last byte in the EIP register. And if you are not sending any payload after overwrite EIP (so if the shellcode is fed before overwriting EIP, and it is still reachable via a register), then this will work. Anyways, we will use the payload after overwriting EIP to host our shellcode, so the address should not contain null bytes. If we now overwrite EIP with 0x01ccf23a, a jmp esp will be executed. Esp contains our shellcode… so we should now have a working exploit. Let’s test with our “NOP & break” shellcode. Run the application again, attach windbg, press "g" to continue to run, and open the new m3u file in the application. The application now breaks at address 000ff745, which is the location of our first break. So the jmp esp worked fine (esp started at 000ff730, but it contains NOPs all the way up to 000ff744). All we need to do now is put in our real shellcode and finalize the exploit. Metasploit has a nice payload generator that will help you building shellcode. Payloads come with various options, and (depending on what they need to do), can be small or very large. If you have a size limitation in terms of buffer space, then you might even want to look at multi-staged shellcode, or using specifically handcrafted shellcodes such as this one (32byte cmd.exe shellcode for xp sp2 en). Alternatively, you can split up your shellcode in smaller ‘eggs’ and use a technique called ‘egg-hunting’ to reassemble the shellcode before executing it. Tutorial 8 and 10 talk about egg hunting and omelet hunters. my $shellcode = "\xdb\xc0\x31\xc9\xbf\x7c\x16\x70\xcc\xd9\x74\x24\xf4\xb1" . $shellcode = $shellcode . "\xdb\xc0\x31\xc9\xbf\x7c\x16\x70\xcc\xd9\x74\x24\xf4\xb1" . First, turn off the autopopup registry setting to prevent the debugger from taking over. Create the m3u file, open it and watch the application die (and calc should be opened as well). Boom ! We have our first working exploit ! You may have noticed that I kept 25 nops (0x90) before the shellcode. Don’t worry about it too much right now. As you will continue to learn about exploiting (and when you reach the chapter about writing shellcode), you will learn why this may be required. What if you want to do something else than launching calc ? You could create other shellcode and replace the “launch calc” shellcode with your new shellcode, but this code may not run well because the shellcode may be bigger, memory locations may be different, and longer shellcode increases the risk on invalid characters in the shellcode, which need to be filtered out. Let’s say we want the exploit bind to a port so a remote hacker could connect and get a command line. As you can see, this shellcode is 344 bytes long (and launching calc only took 144 bytes). If you just copy&paste this shellcode, you may see that the vulnerable application does not even crash anymore. This – most likely – indicates either a problem with the shellcode buffer size (but you can test the buffer size, you’ll notice that this is not the issue), or we are faced with invalid characters in the shellcode. You can exclude invalid characters when building the shellcode with metasploit, but you’ll have to know which characters are allowed and which aren’t. By default, null bytes are restricted (because they will break the exploit for sure), but what are the other characters ? The m3u file probably should contain filenames. So a good start would be to filter out all characters that are not allowed in filenames and filepaths. You could also restrict the character set altogether by using another decoder. We have used shikata_ga_nai, but perhaps alpha_upper will work better for filenames. Using another encoded will most likely increase the shellcode length, but we have already seen (or we can simulate) that size is not a big issue. Let’s try building a tcp shell bind, using the alpha_upper encoder. We’ll bind a shell to local port 4444. The new shellcode is 703 bytes. Let’s use this shellcode. The new exploit looks like this : P.S. I have manually broken the shellcode shown here. So if you copy & paste the exploit it will not work. But you should know by now how to make a working exploit. Good day and thanks for an interesting article. Can you please explain me a couple of things also? 1. “After a push, ESP will point to a higher memory address. After a POP, ESP points to a lower address.” Is this a mistake in the text? If stack grows towards lower memory adresses, then after a push it will point to a lower address. 2. Why is ESP pointing not the TOP of the stack, but to local variables area??? 1. You are correct – it’s a mistake in the text… pushing something on the stack will make the stack pointer point at a lower address… I’ll correct the text. 2. Can you open a forum discussion for your second comment, so we can talk about this offline (I don’t want to make this comments section too lengthy…) ? 101. That’s the buffer length needed to overwrite EIP. So if you create a file with 25000+101 A’s, and then add 4 B’s (42 42 42 42 in hex) EIP should contain 42 42 42 42. We also know that ESP shows data from our buffer, so we’ll add some C’s after overwriting EIP. 25000 + 101 = 25101 and not 26101. Is it a typo ? There rest of the page goes with 26101 after that. may i say i am really enjoying this tutorial, such a pleasure to read. One question, if you dont mind, why do we have a NOP slide of 25 bytes for the shellcode (at beginning) before the calc execution? Again thanks for your tutorial and work, i am sure many people are grateful. The nops are not necessary. If you can calculate the offsets and jump directly to the beginning of the shellcode, you don’t need nops. 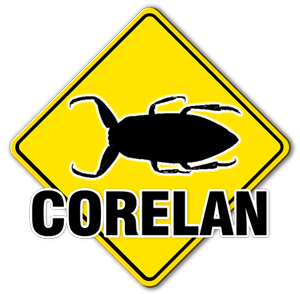 would you mind going to the forum (http://www.corelan.be:8800/index.php/forum/writing-exploits/) and creating a new topic for this ? I am not a complete newbie in this field, but your tuts are still good readings. They remind me of Lena’s RCE tutorias: good quality, and understandable for the beginner. So, thanks for doing this. One note about this first tutorial: greyhat99 asked in one of the comments if the nopsled before the actual payload is necessary, and you answered him no. In fact, the nopsled is necessary if you are using the x86/shikata_ga_nai encoder* , because it makes a fstenv [esp-c], which stores 28 bytes starting at 12 bytes below the top of the stack. This means, that 16 bytes of our shellcode will be overwritten, very likely including some bytes** we haven’t executed yet. Obviously, this would mess things up, hence the need for the nopsled. ** In the case of the 144-byte calc.exe payload, exactly 3 not-yet-executed bytes are overwritten, so a 3-byte nopsled is enough. thx shg. this was driving me absolutely insane. So apart from saying “look at the ‘call stack’ when the application crashes, there’s not much I can tell you right now. to follow your tutorial I’m using a Windows XP SP3 ENG virtual machine (the same as yours I think) but in my case the buffer (“my $junk”) needed to crash the app isn’t “26094” but “26046” and dlls like “MSRMCcodec02.dll” are loaded in different address spaces, in fact the “01ccf23a” return address doesn’t work for me. Can you tell me why? Is it possible that these differences are related to the different patch-level of the XP SP3 operating system? Anyway… thank you for these tutorials, they’re great. This gave clarity on hundreds of topics I’ve heard about/read about/tried myself. I’ve been wanting to learn exploitation for years, and I’ve searched… For years. This tutorial accumulates greater insight on the topic than thousands of forums and wikipedia and other tutorials combined, good job. Great article, one of the best starting tutorials i’ve ever read! the fact that you discovered the different offset and found a working address means that you understand the tutorial … good job sir ! Thank you so much for some great articles. I did have a question about one though. I have been doing these in xp and going back to do them in windows 7. Using the example here (easy rm to mp3) the only way that I could get it to work on reboots was a partial overwrite of a direct address somewhere in the 26000+ buffer, having that surrounded in the middle of 200 NOP’s -> to slide to my shell code. If there is no good jmp/call function in a non aslr file is this a repeatable method across many computers? Thanks again for the tutorials they were really interesting. Hello Peter, and THANK you for the tutorial (it should really be taught in programming courses), i will definitely be reading all the series till part 9.
after a reboot the exploit won’t work (the address in EIP does not contain an FF E4 instruction) and all windows DLLs are loaded in different locations in memory. i think stdio in the post before me found a solution (but i didn’t understand it) can you clarify it please. Windows 7 = ASLR. So it’s normal that the dll’s will be in a different location. The base addresses of dll’s are randomized. Thank you very very much for all tutorials! They are awesome. I try to learn as much and as fast as I can and reading your article of “Hacking Tournament” shows me how far it can go. I’ve tried this on Win7 and after some tries I got it work stable. I’ve restarted to see if ASLR destroys my work but it does’nt. nice – good feedback ! can you please create a forum post about your code and post it there ? but i don’t know why when i post it all the backslashes get lost so you have to add them. well, you don’t really need it. Using a bunch of “x90” (NOP or NO Operation) before the shellcode allows you to be a few bytes off when jumping to your payload. Things should become clear as you work your way through the next tutorials, and if not, don’t hesitate to create a post in the forum. Amazing tutorial. You are truly talented. I have a question though, I’m not sure if someone else asked this but… here it goes. Why was my offset slightly different? My offset of my EIP was 26075? Also my JMP ESP was a different hex value too. It was 0x01aaf23a. Am I doing something wrong when working on this? The offset would be different if the m3u file is in a different path. This is a superp article. I cant stop myself to comment on this article, you are doing great job. While i was trying to replicate this example. It is working fine till the time we want to execute calc.exe, but as far as shell_bind_tcp payload is concerned we are supposed to genereate it using metasploit framework but it’s not working. I had tried creating it through ./msfpayload ./msfweb and even through fast-track scripts. I have also tried encoding it with alpha_upper, alpha_mixed etc. But nothing seems to be working, and then i tried to look it up the ollydbg so what i have found is that whenever i drop my crasher.m3u file in rm2mp3 converter utility. there is an error coming in status bar that there is some access violation error when it go through the shellcode. I dont understand this picture (http://www.corelan.be:8800/wp-content/uploads/2010/08/image_thumb7.png) why “ptr buffer”is after EIP and EBP ) ?? “ptr buffer” is an argument of do_something function , so i think , it has to be the first in the stack , no ?? And now i am a but confused/scared about what can be done against it. The only idea i can think about is use a “jmp esp” of the windows-core-dll’s but if those are compiled with security-compiler-options it may fail too. So whats the best solution then? -o because we dont want windows-dll’s in case e.g. ASLR is used on em (vista and so on) right? That “Fixup:NO” Means that the dll wants to get loaded at its prefered dll-base-address or it will fail the application to load if it cannot load there since it has no “fixup”-rebase-alternative-addresses, is that correct? So thats the reason why it should be reliable because that dll does not like to be put anywhere else? thanks for the donation – much appreciated and very welcome sir ! thank you for this tutorial…. I’m going through this tutorial and have hit a bump in the road. When I have created the crash25000.m3u and drag it into the app, the damn thing will not crash..
can you post your question in the forums please ? Very nice introduction :) Congrats! There is a one tiny bug I think :) You have let a \x00 byte in the final shellcode on line 4. It seems working when it is changed with \x41. great mate I have worked though this over a course of days after seeing it linked in on the security tube metaspolit mega primer. got everything working but without a word of a lie I had no idea what was wrong with the shell code until I read the post where someone drops the spolier. thanks again will be working through the rest now. This may be a stupid question, but it’s been bothering me since I read the article. My question is simply, why not overwrite the EIP with the direct (absolute) address of the shellcode? I assume it’s because the function call sequence can be different with each invocation. With a different call sequence the stack frame would always be the same (let’s say for example relative to the ESP +/- some number) but the frame itself could be placed at different locations, so using a absolute address would fail! that is part of the reason (stack address would be randomized). second issue would be null bytes (as stack address usually starts with a null byte). In this example, the overflow is based on a string and the null byte would break the input. Awesome work. I’ve been looking for a resource like this off and on for years. Most other resources that bring in debuggers don’t communicate in a way that can be understood by someone seeking to learn. Keep up the good work. This is truly fantastic. Amazing work!!!! Want to do all of them, now! Great lecture, thanks Corelan Team. Just to say that the src image pointing to “http://www.corelan.be:8800” dont work , especially at the beginning of the tutorial. Hi Peter. First of all, I would like to thank you very much for dedicating part of your time writing these amazing tutorials. I’m studing hard for the Offensive Security Certified Expert (OSCE) exam and your tips are helping me a lot. Also, I can see that you are very attentive, anwsering all the questions, and I would like to thank you for this too. I have one question about the LEAVE instruction: when you say that “The epilog instruction is executed by a LEAVE instruction (which will restore both the framepointer and EIP)”, wouldn’t it be “which will restore both the framepointer and ESP”, as the EIP is restored by the RET instruction? Thanks again, sorry for my english mistakes, and congratulations for your job! yeah, that’s correct. Good catch ! I am new to exploit development but i know how to do a reverse engineering on several softwares. As I have a problem regarding your first exploit tutorial, i have a confusion whether i open the rmplayer first and attach the process to debugger and then open the vulnerable file , or first open the immunity debugger ( my favorite) and then in that I open the RMplayer then open my vulnerable file . I am using win 2003 server plateform. One thing more I want one suggestion from you ..is there any book on ruby and python language tutorials which could help in the exploit development , as i am very new to the language like ruby and python. @ ghochu: there are links to pdf versions of the tutorials at the top of the pages. You must be logged in to download them. hey im talking about malware analysis tutorial (infected doc and pdf) and how to pach them …. Some links to images are broken in the tutorial. Can you update related images/links. some images may be pointing to corelan.be:8800 – can you make sure you can access port 8800 ? İf we override EIP with AAAAs, EBP should also be overridden (since it’s before (in the higher address)). But in debugger EIP is 41414141 but EBP is something else. Thank for reply, and for this great tutorial. Additionally images are loaded now, my firewall was blocking this port. corelanc0d3r, I just registered here to congratulate him. Ur tutorial is awesome and well written. It’s a great initiative! I was able to duplicate everything besides the Telnet example =/. I even went to metasploit and create the shell for bind_tcp, but still did not work. I guess i’ll keeping going and hope i don’t get stuck anywhere else. I see what you did…. Well, i got it working. How ESP is overwritten after EIP ? Can u explain that ? Just a litte note, if your converter program expires, I would say that 00419359 would be a nice address to take a look. You will find it with NOProblem. 2. )For beginners, open Backtrack 5 and type this in terminal ” msfvenom -p windows/shell_bind_tcp -e x86/shikata_ga_nai -b ‘\x00\x0a’ -f perl EXITFUNC=seh LPORT=4444 ” a shellcode will be generated. Thanks for this awesome tutorial..
What is that means?Am I doing something wrong? Fist of all thank you for all of your work, it is very helpful ! Why do you represent the stack above the heap ?